This was another regularly scheduled, weekend activity for the Climbing-Knapsack Section. I drove three others who were game for some High Sierra summits. These were to be two one-day climbs, with car camping and fine dining promised in the town of Bishop, CA. I had taken Monday morning off at work in anticipation of problems. Three of the participants were new to climbing. One experienced climber, Bill, met us for breakfast in Bishop. Two others who, perhaps, weren't so sure of joining us, also had breakfast with us. I assumed everyone knew the way to North Lake trailhead, where we were to start our first climb. I drove west up Highway 168, or West Line Street, which was mentioned in the schedule ad. We came to the North Lake hiker parking lot in about a half-hour from town. The two who met us for breakfast failed to appear. One of the climbers became agitated that they hadn't shown up, and forced me to spend an hour driving back to check the overflow trailhead parking, further down the road. They weren't there. We were losing time, so I had to order a start without them. It turned out that they had really gotten lost just trying to get to the climb. They did not know how to get to North Lake, and rather than just ask, they instead drove south to Lone Pine on U.S. 395. Or, maybe they are just part of the chapter pizza and beer crowd. Our start at about 8 or 9 a.m. was then a bit rushed. The weather looked excellent, so there were no concerns for lightning storms. I figured that this was an easier peak, with only about 4,000 feet gain and short miles. 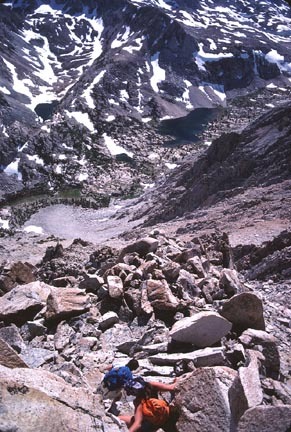 We began hiking up the trail to Piute Pass. At about Loch Leven Lake, we discerned the chute that leads up to the top of Mt. Emerson. It didn't look like much of a challenge, but it was a real "grunt" for the newcomers. We approached the high peak ridge. Then, as the Climbers Guide says, we looked right for a route just below the top of the ridge. The true summit was over there, and the going became steeper. One beginner climber, Al, called a halt for himself. Bill, the experienced climber, and the two gals were more game. I searched about and found a series of ledges in the otherwise class 4 or 5 cliffs. I then guessed correctly at the location of the true summit. I headed up easy class 3 rock to reach the main summit ridge, and saw the summit pinnacle just over to the east. Bill and I scrambled ahead and we posed on the summit for a picture by one of the girls. She wasn't very good at photography, but the photo was usuable. They also joined us at the top. I read through the register. The weather was fine, and the day was gorgeous. We started down in the mid to late afternoon. After again finding the class 3 ledges (photo above), we picked up our waiting hiker. Bill flew down the scree slopes all the way back to the lake and the regular trail. The two gals and the one other climber slowly descended, as they weren't used to scree running, and were probably tired. Taking a good long rest once we were down, we had then only the few miles of trail to walk back. We arrived at the cars at just about dusk. Driving back down into Bishop, we wanted a good meal, so went to Whiskey Creek Restaurant, said by locals to be the best. We had a table. The two lost wannabes joined us and contributed their merry banter. I had a seafood dish, and beer and wine flowed aplenty. After we finished our fine feast, we then drove back up Highway 168 to camp. We had to sleep on hard pavement or car seat, since the campgrounds appeared to be all full. Awakening early, we had some impromptu breakfast munched down without any cooking. Then, only the carload of the original four of us proceeded to the Green Lake trailhead. Too much for the others! The trail start is hidden around the back of Rainbow Lodge (old Parchers Camp). We all wished to make it home at a decent hour, so hurried more than ever up the trail. Passing by a couple lakes, we followed the trail to a high plateau, where we started cross-country for Cloudripper. I warned that a four hundred foot elevation drop was necessary to get to the summit. The two girls were too tired, so decided to stop. The one other climber, Al, wanted to get one peak for the trip, so bravely continued with me down the scree and boulder elevation dip, and continued with me to the rocky summit. He wasn't used to rock scrambling, and had a problem with the hazard of slipping or losing his balance. I encouraged him, trying to find easier moves to give him confidence. We completed the class 2 climb. He was a little nervous about all of this. 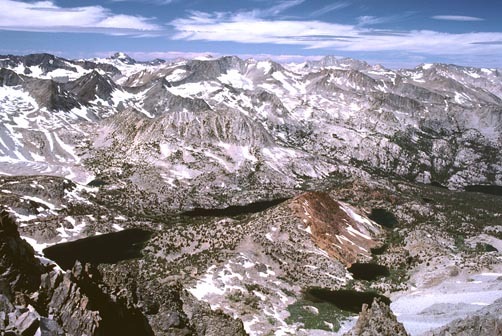 Along the way were views of three separate chains of High Sierra lakes--Bishop Creek, Big Pine Lakes, and Baker Creek Lakes. Looking through the register took some time. We started downclimbing back carefully. I was worried that poor Al might injure himself. This was a person with little experience. We reclimbed the 400 foot dip, then I decided to check out the low rocky summit of Peak 13,356'. I found a register naming this as "Vagabond Peak." I thought that was cute, since now I had completed ascents of three named 13 thousand foot peaks this weekend. The other hikers gathered together on the lower sandy portions near the trail, and waited, despite their perceived need to rush to get back home. When I climbed down back to them, I set them loose for the car. I took more pictures, and then enjoyed another safe and successful completion of a pair of SPS listed peak climbs. We arrived at the car by about 5 p.m., and began our long drive home. I have forgotten where we stopped for dinner, but the girls had needed a big break from sitting in the cramped back seats of my subcompact. It is so annoying when you want to stretch out your legs, especially after all of that climbing! I requested some gas sharing dollars, as was standard on these trips. They protested, since I got about 35 mpg. An amount of $15 apiece would be over-profiting, by them. They didn't taken into account that they wouldn't ever be doing me a reciprocal favor. I don't think that they would ever want to do something like this again. I let them vote, and I accepted ten dollars apiece from the three of them. Would thirty dollars compensate most drivers for the 700 mile plus round trip drive for just this two day weekend? I think not. However, I did get three good peaks, and was thankful for the opportunity and support. The total gain was about 4,000 feet for Emerson, and 5,000 feet for me on both Cloudripper and Vagabond Peak. The total miles was perhaps 16, round trip.